On Sale Now! Save 5% on the San Giuliano Freshly Stone Crushed Unfiltered Extra Virgin Olive Oil, 33.8-Ounce by San Giuliano at Your Daily Food Choices. Hurry! Limited time offer. Offer valid only while supplies last. 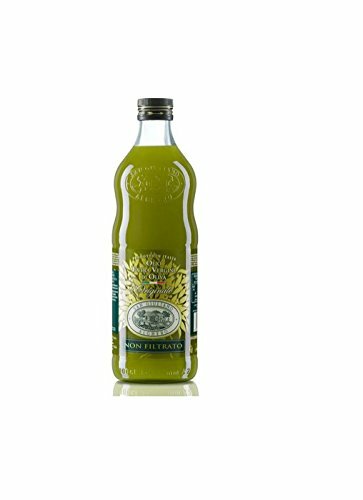 The unfiltered San Giuliano Extra Virgin Olive Oil comes from the freshest green fruit of the olive picked at the earlystages of the harvest period. The unfiltered San Giuliano Extra Virgin Olive Oil comes from the freshest green fruit of the olive picked at the earlystages of the harvest period. This oil is not filters casuing the original characteristics of the olive to be preserves. Freshness, cloudiness and light nuances of spice witha fruity note best describe the attributes of this oil.. The unfiltered San Giuliano is recommended for marinades, salads, bruschetta, and garlic and focaccia bread, raw vegetable dip, vegetables, fish and meat dishes and all of those dishes in which you want to add a distinctive and characteristic note. Can be used for both baking and frying. The presence of sediment at the bottom of the bottle and cloudiness represent a natural characteristic of this oil. No cholesterol, sodium free and trans fat free. If you have any questions about this product by San Giuliano, contact us by completing and submitting the form below. If you are looking for a specif part number, please include it with your message.